Though located in affluent Newport Beach, UNB is an important destination for schools and community groups from underserved areas of Orange, Los Angeles, Riverside and San Bernardino Counties. When students are asked at the start of a BBSC Marine Life Inventory, many students (even those from schools in the adjacent Costa Mesa) have never even been to the beach. A field trip to the BBSC allows the students to see things that most have only heard the teacher talk about in class. They see egrets wading in the shallows, pelicans diving for fish and mullet jumping out of the water. They see migrating birds feeding in the mud and they can understand why vanishing wetlands have a global impact. Classroom concepts suddenly comes alive. Having stimulated the students’ enthusiasm for nature, we also want to be able to nurture their interest in scientific investigation and problem-solving through an examination of the biology of the estuary at a microscopic level. Many teenagers are curious about the variety of analyses that can be done with sophisticated lab equipment, but are intimidated by their apparent complexity. So in a classroom with only a limited amount of equipment, only the most confident students step up to use it. Those that would most benefit from an extended hands-on lab experience have little opportunity to get comfortable using even basic equipment. 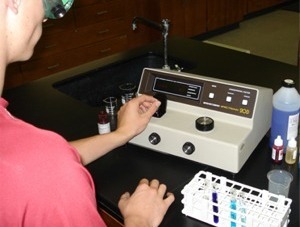 And not many schools can afford the array of important analytical equipment the BBSC intends to have. Middle school and high school teachers throughout Orange County and beyond eagerly await the opportunity to bring their classes to the BBSC. Nearly 200 science teachers from Grade 7 through college responded to a comprehensive survey seeking input on 30 lab and/or field activities that may be offered here. Unfortunately construction of the facility coincided with the dramatic worldwide escalation in the cost of concrete, steel and other building materials. As a result the BBSC was built, but there were insufficient funds to complete the outfitting and furnishing. NBNF has committed to help raise money to outfit and equip the BBSC to fulfill its education mission.